Having just fed the barn kitties, I headed toward the chicken coop to gather eggs. On the way, I stopped and looked up, closing my eyes. I stood for a moment, letting the warmth of the afternoon sun wash over me. When I opened my eyes, I saw an autumn sky that was clear blue with wisps of clouds like white gossamer. The burnt colors of foliage lining the sheep paddock caught my attention; too little rain late in the summer had muted the usual fiery, fall palette. It was still a lovely sight, and it was perfect weather for Honey Hen to be outside in the fresh air. But then, I remembered. Honey Hen, a pet chicken unable to walk well or lay eggs anymore, had become part of my day-to-day routine. Although she didn’t have perfect mobility, Honey was still a fairly healthy, hearty bird. She enjoyed being outdoors in her favorite spot near the corncrib that Great-grandaddy Rieley built as well as pecking at clover and fanning out her wings in the sunshine. Everyday I prepared a plate of fruit and vegetables for her–especially when she couldn’t go outside. On warm days, when Honey was able to go out, I constantly checked to make sure she was in close proximity to her food and water as well as near a source of shade; and, on cold days, I turned on the heat lamps in the coop for her comfort. Honey was content to be inside her coop, but I also knew she anticipated my visits—especially since I often found her waiting for me by the door. She enjoyed being outside, but more than that, she absolutely loved the grain treat she received daily. She was the most determined little hen. Whenever she caught a glimpse of me, she would stand—a bit unbalanced, and waddle in my direction at full speed while furiously flapping her wings. This exuberance usually only lasted momentarily as she quickly lost her balance and wiped-out with a face-plant in the grass. Although I cringed when this happened, her enthusiasm and effort always touched me. Honey was a kind of mascot for Green Hill Farm—a symbol of perseverance. She began having difficulty walking a few years after we got her, and eventually she was unable to leave the coop. It was then that I made sure she had outdoor time, if possible, placing her by the corncrib to eat grass and clover while the other chickens free-ranged. This was Honey’s ritual for about a year—that is, before a marauding fox massacred our flock of fourteen hens one afternoon last fall. Gratefully, Honey was by the corncrib and escaped the terror. Afterwards, I worried about her being all alone in the big coop by herself, especially with winter coming. We added an extra heat lamp and shavings for warmth, but I was also concerned about her social well-being. Chickens sleep huddled together for warmth in the winter, but they also coo and chirp and make other chicken noises that I imagined Honey was used to hearing. So, I looked for a device that made natural chicken sounds, but alas, there was no such thing. Then, I thought a stuffed, toy chicken might be a good idea as…”chicken company.” Unfortunately, the meeting between Honey and the mostly authentic-looking chicken didn’t go as I envisioned. The fake hen I ordered was twice Honey’s size, and she couldn’t get away from it fast enough. Although I was worried about her, Honey was fine. She enjoyed sitting under the heat lamp and dining on a variety of fruit and vegetables everyday, and she didn’t even seem to mind that she was alone. Honey always appeared perfectly content, whether cooing in my arms as I petted her soft feathers or sitting in the middle of the salvia plant with its sprawling purple blooms. I couldn’t help but admire her spirit of fortitude. While Honey was mostly healthy and independent during her tenure on Green Hill Farm, her health began to decline mid-summer. Honey’s mobility was worsening, and she was weaker. She was also having minor difficultly with basic things like using the bathroom efficiently as well as accessing her food and water. We made modifications; such as, moving her food and water closer and checking her bottom daily for cleanliness. Then, one day, as I went to take Honey outside, I noticed something was wrong. As I opened the coop door, she staggered toward me; I could see that she wasn’t well. I picked her up and determined part of the problem—her bottom was soiled. After washing her in a bucket of warm water, towel drying her body, and placing her under a heat lamp, I made Honey something to eat; however, instead of the enthusiastic reception the vegetable plate usually received, she only pecked at it once or twice. She just sat there, still as could be, with her head bowed toward the floor. Bending down, I petted her and repositioned the bits of tomato to make them look more appetizing, but she wasn’t interested. Honey remained the same over the next day or two, and I kept thinking, maybe she’ll be okay—hoping she would pull through as she’d done in the past. I loved this little hen. I didn’t want to let her go, but I also didn’t want her to suffer. I realized I needed to make a decision. Although it didn’t seem like the right time, in my heart, I knew it was. Begrudgingly, I picked up the phone and called to see if my local veterinarian could make a farm visit. When Dr. Witt arrived, we made small talk about the farm and other family anecdotes, but all the time, I felt a heaviness in my chest. We finally headed in Honey’s direction. I opened the door to the granary coop, and there she sat, just as I’d left her. She hadn’t moved and the plate of food was still untouched. I carried Honey outside, placing her on a towel in the grass. Dr. Witt examined her. Besides having muscle atrophy and weight loss due to her limited mobility, Honey’s body was failing. Dr. Witt assured me that it was time, and that I’d done all I could for her. We gently placed Honey on her back and unfolded her wing. I kneeled on the grass beside her as Dr. Witt administered a sedative to make her comfortable. Honey lay there, calmly, looking up at me. I slowly moved the tips of my fingers along her face and whispered, “You’re okay…I love you, Honey Bunny.” After a moment, she closed her eyes, and Dr. Witt asked me if I was all right to proceed. I nodded as I wiped away the wetness from my eyes and cheeks with the sleeve of my shirt. We sat there on the damp grass and moments passed. I continued to pet Honey’s face and quietly repeat my mantra: you’re okay…I love you. More time passed and Dr. Witt took her stethoscope from around her neck and listened to Honey’s heart. Apparently, Honey’s heartbeat slowed, but then it gained cadence, again—something to do with her poor circulation. Dr. Witt informed me that Honey would need another injection. She asked me to press on a blood vessel as she administered a second dose of pentobarbital. As she did this, Honey opened her eyes and looked at me. “Did she feel pain?” I worriedly asked. “No, just a little discomfort,” Dr. Witt reassured me. We waited, again. I looked down at Honey through a blur of tears, my shirt sleeve completely soaking wet now. Dr. Witt checked Honey’s heartbeat for the second time. When Farmguy got home, we buried Honey in her favorite spot—by the salvia plant in front of the corncrib. Hardly a day passes that I don’t think of Honey in some small way. I know she was just a chicken, and there was probably a medical reason for what happened, but Dr. Witt’s words weighed heavily on my mind as well as on my heart. The thought of Honey’s heartbeat speeding up again and again moved me. Being a sensitive person can make the loss of a beloved pet even more painful; however, I don’t regret my sensitivity. While it makes sadness more poignant at times, it allows for great joy as well. I believe it is the catalyst that creates a feeling of empathy, enabling us to help others who need a little, extra loving-kindness—or, maybe, even care for a fragile hen. Here’s the thing: I realize that I took extraordinary measures to ensure a longer and better quality life for Honey, and to a lot of people, it doesn’t make sense. Why keep a chicken that doesn’t lay eggs and only creates work and expense? I understand that point of view; everyone’s situation is different. 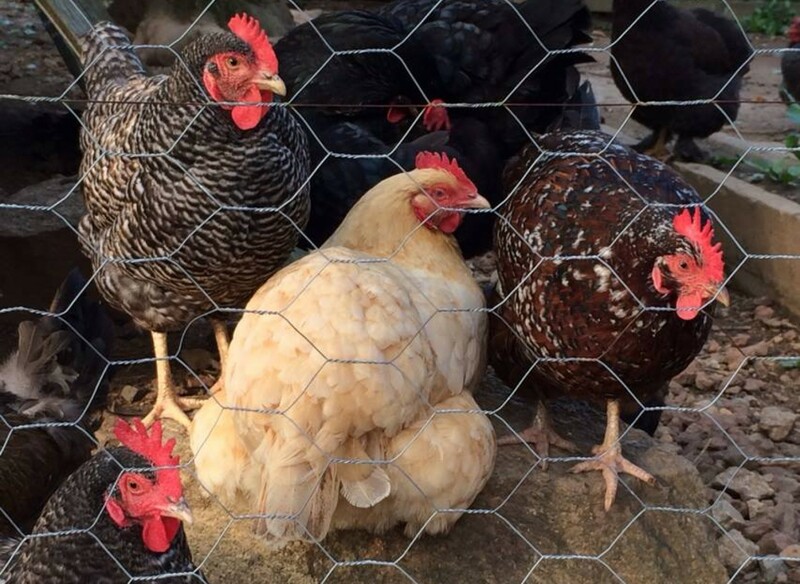 For us, Green Hill Farm is a hobby farm as well as a place of sanctuary for everything from cats to chickens. But beyond the definition of my farm, there are two reasons I couldn’t take Honey’s life before it was time. Those two reasons are fundamental to who I am as a person: First, it is my belief that animals are more similar to us than they are different; and second, I always ask myself—“How would I feel if it were me?” Honey’s value didn’t lie in the number of eggs she produced, but rather, in what I learned while she was in my care: greater patience, compassion, and humility. Yes, it is true. A little, disabled chicken taught me to be a better person…..and, isn’t that worth a lot more than a basket full of eggs? It is amazing the effect animals have on people. Even those I know who raise them for livestock get attached to them. It’s true. In most cases, I believe animals have a positive effect on people. That’s why there are therapy dogs in hospitals and nursing homes, etc. to increase morale and social interaction among patients and residents. Interaction with animals has been proven to increase language and social interaction in children who have autism as well. Animals seem to have an intelligence and ability to sense people who need them. this is true !!! offers in old age or kindergarten or similar house we see here in germany a garden with wishes, they have effects on us who are worth. A beautiful story, Tonya. Thanks for telling it! Thank you so much, Christina. I know you have chickens, too. And, it’s easy to get attached to their interesting and cute personalities. Such a beautifully written post and a sad but sweet story. Thank you for the lesson! Many thanks for your lovely comment. I am sad and happy for you, all at once. What a life-affirming experience you had here. She may have taught you some things about perseverance and strength, but she was so lucky to have someone like you, Tonya, who took extraordinary steps to ensure a quality life. You should be so proud. Life is sweet on your farm, for every creature there. It is touching the time and attention you give to Honey. It is always sad when a favorite animal must be euthanized. I enjoyed the feeling of this post very much. It is sad to say goodbye to a much loved pet, but I’m forever grateful for my time with Honey Hen. Thank you very much for your thoughtful comment. How touching! This was beautifully written, and I sadly enjoyed reading it. You are really sweet, Anne. Thank you for such a nice comment. What a lovely & sad story. Honey was a part of your family and you cared for her. If only we all cared and helped each other like that. Bless you. It brought me to tears as I remembered my beautiful cat Sam and how much I miss him. What a sweet story about how our hearts are touched by the animals in our lives, be it cat, dog or chicken! It doesn’t take long for our animals to steal our hearts. you are right-when you share the same patch of earth, something happens-something is shared that is very intimate. What a lovely way of seeing things. Thank you. This is indeed heart warming and touching. Honey was treated in such a humane manner and she knows you really loved her. This is really unique and shows your love for farm animals or all living things. You are blessed as you bless all living things with respect and much love. Thanks for reminding me that all living things are to be respected. I so appreciate your thoughtful and kind words, Garfield. Thank you. In my brief chicken experience, that is how the last days go. A hen just settles in, tucks her head down between her shoulders, and stays still for a few days. Living amongst a landscape of commercial farms, I do not call a vet because I suspect they’d think I was crazy to worry over a lone chicken. I just coo comfort to her and send her my kind blessings until the end. You’re right. If you raise chickens, there are definitely signs to watch out for when they’re not feeling well. Thank you for visiting. Lovely post, and it made me cry. I wrote about the loss of my black hen Jupiter Janie, and how devastated I was, a couple of months ago. We love our animals and that is a good thing. A wonderful story, Tonya. We have so much to learn from animals. We just need to listen and pay attention to them. You have such a great gift, Tonya. RIP, Honey Hen. ❤ ❤ ❤ Much love to you and Honey Bunny wherever she is.